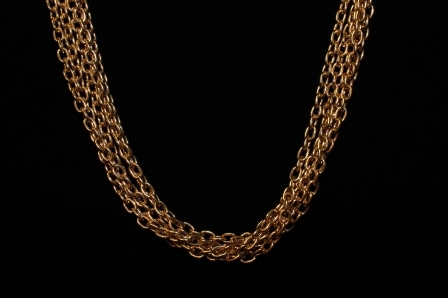 This is a vintage necklace signed by Givenchy. 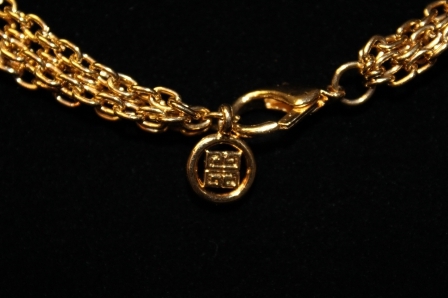 It is multi strands of gold chains held together with a Givenchy clasp. Worn short in length. The house of Givenchy was founded in 1952 by designer Hubert de Givenchy and is a member of Chambre Syndicale de la Haute Couture et du Pret-a-Porter. Hubert de Givenchy made loyal clients of some of the most important women to wear clothes in the last century – with names like Guinness, Grimaldi, and Kennedy (Jackie apparently wore Givenchy to President Kennedy’s funeral). It was Audrey Hepburn, however, that perhaps most summarily embodied his style: ladylike modernism. And with that, Hubert de Givenchy carried the glamour of the early 1950s through four decades worth of collections until his eventual retirement in 1995. 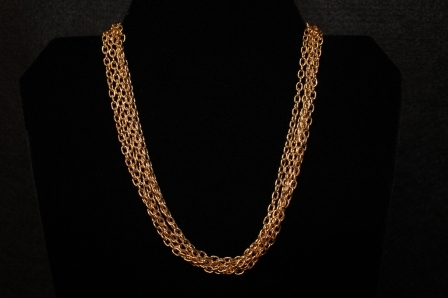 Expect primarily gold jewelry that make simple, but bold decorative statements. Modern Givenchy is sold today at upscale department stores like Barney's, Saks, and Nordstrom.